West beyond Pewsey, cloud base ahead dropped by 1000 ft with grey stuff falling out of the bottom. The lack of cloud shadows on the ground beyond revealed sky to be quite ‘dead’, so the trip to Devizes was cancelled for another day. 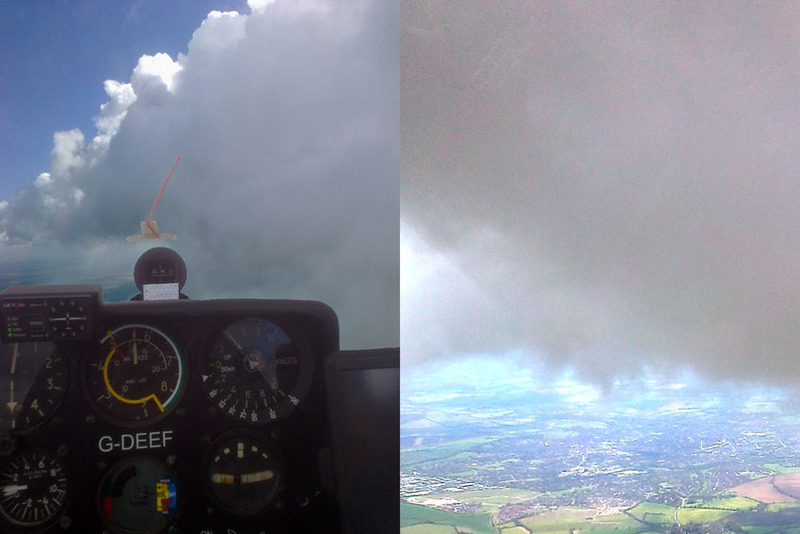 However, curtain cloud being sucked up ahead of the miasma looked quite promising and turning north along the ‘front’ permitted 5000 ft to be maintained to Ramsbury. And when it ran out, turning back provided lift enough to sustain 4500 to 5000 ft down to Andover. A voice on RT was warning aircraft in some local circuit to take care as the wind ‘was all over the place’ and on dodging round the back of the ‘front’ to return to Rivar a strong gusting crosswind resulted in one of those character forming landings. Not exactly what was planned, but sometimes gliding is more akin to Forest Gump’s ‘box of chocolates’.